The head of the Libyan National Army, Field Marshal Khalifa Hafter, has ordered all militias in Tripoli to lay down their arms or face attack from his forces. In a statement just hours after pro-Hafter demonstrators were fired on in Tripoli, he annoucned he would will liberate the capital, and attacked what he said were the criminal actions of “tyrants and terrorists” who had shattered the right to peaceful protest. 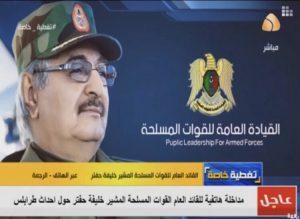 In a stirring telephone interview at 2.30am localtime with Al-Hadath Al-Libya TV channel, Hafter insisted his forces would force the gangs who had killed innocent civilians out of the capital. He accused the “oppressors” of humiliating Tripolitans and destroying state institutions. They had to leave now and hand over their weapon, he insited. For its part, the LNA would restore peace and stability soon enough, he added, with Tripoli once again becoming “a symbol of culture” and freedom. With the capital in turmoil, he said, the world stood by as peaceful protestors were shot at while they demanded that the militias leave. But it was proof of the importance of the LNA and its role in obliterating terrorism, he declared. That could not longer be argued about.